If you’ve been using Nocturne to get the black menubar in Mac OS X but don’t care for any of the features outside of the darker menu bar, check out MenuBarFilter. 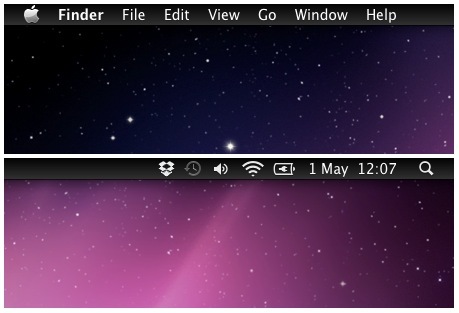 All it does is turn the Mac menu bar color into a dark black gradient, closely resembling iOS. Download MenubarFilter now or head to the github page. Why would you want to stop running this gorgeous little add-on? Bugs of course. MenuBarFilter certainly works in Lion but it doesn’t play that well with Mission Control or full-screen apps, and you’ll see some display artifacts and mismatched colors here and there. I’ve been using it since last night and as long as you don’t expect a perfect fit quite yet, MenuBarFilter is a very nice looking customization to Mac OS X.
Wow this should be an Appearance option, looks great but it would be nice if it expanded down into the menus. When I open up MenuBarFilter, the menubar flashes black and then turns transparent again. I go to the activity monitor and the app is still running, but the menubar isn’t black. Nevermind, I just had to put it in my applications folder and not open it from the desktop and it worked. Glad you got it working, because I was unable to replicate your original issue! hey i have an issue where it will work for my other desktops spaces but not the first one. I have the program on my applications folder and set to open at startup and it works all over except for my main desktop. Any idea why? There’s also something called Obsidian Menu, it overwrites the default image files but doesn’t work too well with third party menu apps though. My main beef with these apps is that it just inverts the menu and and turns the highlight into a psychedelic mess, plus it doesn’t change the pull-downs. Having a choice from Apple would be ideal, but they seem pretty stuck on this whole aluminum thing. Is there any way to disable it? killall Finder doesn’t disable it. I really like this mod but it doesn’t work on my 3rd display running off a USB->DVI converter. Did you find a solution to get it to work on your 3rd display? I can’t get it to work on my 2nd monitor which has SecondBar. Very cool. I already had changed my appearance, this is a nice addition. nice work but it does’t launch on startup on my mac, leocolor has been discontinued, any other options more colors? Hey I can’t find it in Activity monitor andwhen I tried it in Terminal, nothing happens. I wanna change my menu bar in its default color.